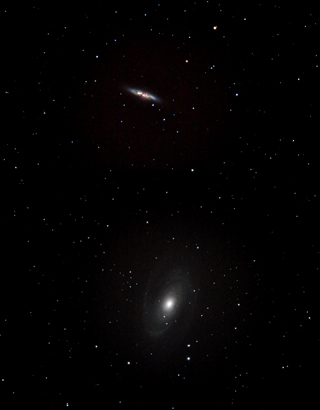 Separate images of M81 and M82 were combined to produce this montage. Imaged with Celestron CGEM 9.25 @ f/6.3, Nikon D90. 24 images of M81 at 20 seconds each, and 21 images of M82 at 20 seconds each were individually stacked into individual images that were glued together in Adobe Photoshop. Curves and saturation levels were adjusted.